Samsung has announced that it is the memory maker that has enabled the new Turing GPU based Nvidia Quadro RTX graphics cards. Nvidia's latest and greatest professional GPUs utilise Samsung's industry-leading 16Gb GDDR6 memory chips, which doubles device capacity compared to its 20-nanometer 8Gb GDDR5 memory. Furthermore, the memory uses 35 per cent less power than GDDR5 and can perform at a 14-gigabits-per-second (Gbps) pin speed. "It's a tremendous privilege to have been selected by Nvidia to launch Samsung's 16Gb GDDR6, and to have enjoyed the full confidence of their design team in making our key contribution to the NVIDIA Quadro RTX GPUs," said Jim Elliott, Corporate Senior Vice President at Samsung Semiconductor. 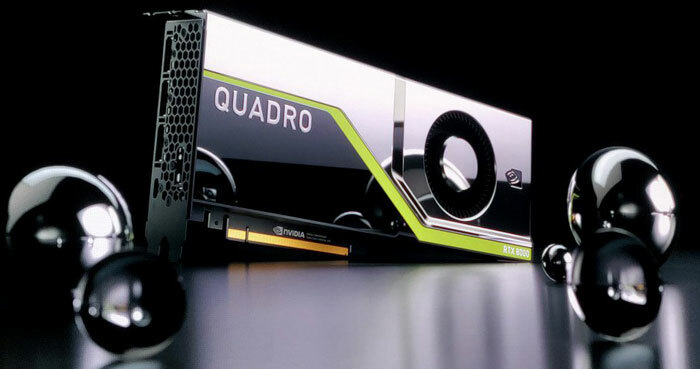 As you will have read earlier today the new Nvidia Quadro RTX 8000, Quadro RTX 6000 and Quadro RTX 5000 GPUs bring hardware-accelerated ray tracing, AI, advanced shading and simulation to creative professionals. Samsung narrows down the new pro GPU's worldwide availability to October (more precise than Q4). The new maximum of 48GB of onboard (GDDR6) memory enables users of Nvidia's Quadro GPUs to work on the largest models and scenes, and increase application performance, enabling professionals to design, develop and deliver much better results with faster turnaround. Samsung adds that its memory will facilitate improved performance and energy efficiency in graphics-intensive applications such as CAD, digital content creation, and scientific visualisation. The new faster memory will also benefit Turing with its 8K Ultra HD video processing, virtual reality (VR), augmented reality (AR) and more (in some upcoming consumer cards?). On the topic of performance, Samsung said that the 16Gb GDDR6 chips perform at 14Gbps pin speed, allowing for data bandwidth of up to 56GB/s. This represents a 75 per cent transfer speed increase compared with 8Gb GDDR5 memory. Furthermore, Samsung 16Gb GDDR6 memory operates at 1.35V, compared to the 1.55V consumed by GDDR5, and will consume about 35 per cent less power.